It is my great pleasure to take part in the release day celebration for Flying Lessons & Other Stories! 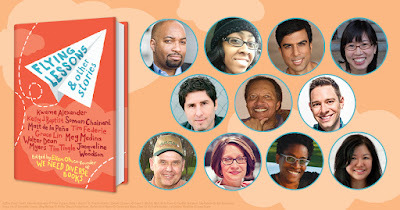 This wonderful middle-grade anthology was made in partnership with We Need Diverse Books, which was co-founded by the editor, Ellen Oh. I was lucky enough to be able to read an advanced copy of this collection - thank you Random House Kids! - which I have reviewed below. 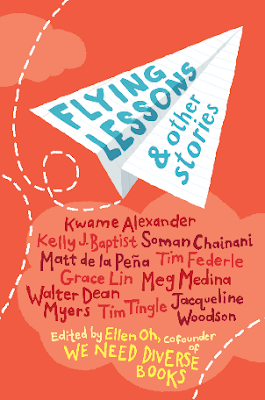 So check out Flying Lesson & Other Stories, read my impressions, and pick up your own copy today! It is no secret that the world needs more diversity. Or rather, we need to embrace more diversity. How boring would it be if everybody was exactly the same? I personally love how people are so different from one another, with different traditions, food, languages, culture, mythologies, you name it. Lately, I have been making a conscious effort to read more books with characters of a different background and ethnicity than my own. I have found that doing so has greatly enriched my life and made me even more curious about the world around me! Having this desire to read more diverse books in my own life made it easy to jump at the chance to read Flying Lessons & Other Stories. The funny thing about me reading an anthology is I have never really been a fan. Now, I'm not saying they're bad in any way, it's just that I get involved in the story, the characters, and then it... ends. I want more! I have tried my hand at reading them a few times, but I still found I had a hard time not knowing more. Am I alone in this? Anyway, one of the things that impressed me most about Flying Lessons & Other Stories is the fact that I felt they all ended quite well. They seemed much more full and complete on their own than others I have tried in the past. Kudos to all! One of my favorite stories was Choctaw Bigfoot, Midnight in the Mountains by Tim Tingle. I loved "Turtle Kid", his dozens of cousins, and his animated Uncle Kenneth. The story Uncle Kenneth tells about the Naloosha Chitto, or Bigfoot, is awesome. I could easily visualize all the children gathered around their Uncle Kenneth at the big family event, listening with wide eyes, and asking many questions. This story was charm itself. Another favorite of mine was The Beans and Rice Chronicles of Isaiah Dunn by Kelly J. Baptist. My heart broke and lifted continuously for Isaiah and his family. They experience a lot of hardship, and he misses his father tremendously, but Isaiah always seems to find a way to make it through. He is one tough kid, that is for sure. Along the way, he discovers some stories his dad had been writing. It was lovely to see how Isaiah pays homage to his father whilst also trying to keep his family afloat. Isaiah's tale is at times sad and heartbreaking, but ultimately hopeful. I could talk and talk about the stories within this anthology for quite a while, but I shall refrain... for now. Honestly, I was most pleasantly surprised at how much I enjoyed this particular anthology. I would love to read longer versions of so many of them, but I am satisfied with the length of them nonetheless. Flying Lessons & Other Stories is a spectacular anthology with top-notch authors and engaging stories. I highly recommend it to all!